Convey your message of reverence to a heart you cherish with this Spruce Collection of Breathtaking Blossoms and gorge that heart with delight of love. 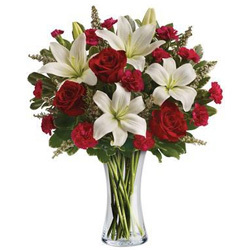 This Collection showcases pretty Blossoms that is to say 4 White Lilies and 5 Red Roses and dapper Fillers. Note: Vase is not included. Convey your message of reverence to a heart you cherish with this Spruce Collection of Breathtaking Blossoms and gorge that heart with delight of love. This Collection showcases pretty Blossoms that is to say 4 White Lilies and 5 Red Roses and dapper Fillers with Small Cadbury Celebration. Note: Vase is not included.